Nuclear boats are the most cost-effective means of delivering grief to the opposition in terms of cost per grief unit (what ever that is.) Of course we should continue to have the ultimate threat available to us on our own initiative. What we need is a benevolent alien to land and tell us that they’ll zap anyone who misbehaves too badly. I’m surprised God doesn’t do it, but that’s another matter. In the absence of either God or an alien, and with the NNPT only good for bum-wiping, we need sufficiently diverse nuclear countries with sufficient power to ensure the destruction of any state which oversteps the mark. As Liam Fox suggests, a National Missile Defence program would remove the “mutually” from mutually assured destruction and reignite an arms-race. Rather than improved weapons systems, to prevent proliferation we need to stop dubbing countries as evil. One of the problems you have with a missile defence system is how do you test it. The tests are carried out, with everybody knowing when the missile is coming etc, so the operators are alerted. To carry out an effective test, you would have to simulate actual conditions. Have operators sitting in their bunkers, and say anytime in the next two years we will fire a missile at you, you'd better be ready. Then fire one on a wet winters night, at 0200 hrs in the morning, when everyone is at their lowest ebb, see if they intercept that one. Before any one says, computerised, fully automated system, really good luck! As for the nuclear system required, a massive response system is probably no longer required, a nuclear option is. The next generation of cruise missiles, with higher speeds and greater accuracy would probably be sufficient and offer a variety of launch vehicles air, land or sea. "As Liam Fox suggests, a National Missile Defence program would remove the “mutually” from mutually assured destruction and reignite an arms-race." Yes, but it would remove the "mutually" in our favour - surely that's desirable. david, you are undoubtedly correct in what you say about the defense system, but building one is the only way to eventually create an automatic system. Missile defence is a complete red herring. The threat is not from missiles winging their way through the skies from Tehran or Pyongyang. The threat is from nuclear bombs being smuggled into this country in lorries or briefcases and planted in a house somwhere in London. Building a system that wont work to combat a non-existant threat is just a waste of everyone's time and money. Not so sure Jon.You may be right in 2006 but what about 2020? It could be a waste of money (I really,really hope it is) but it could also be a vital insurance policy. I hope that if we replace Trident with another system it is built in Britain and totally controlled (as Trident isn't) by our own political masters. I do agree with you 'though that the prospect of nuclear terrorism is a very real threat. I certainly agree with you about building and controlling Trident in Britain, (not controlling our deterrant is a farce) but even in 20 years time I trust in MAD to protect us from direct attack by rogue states. It is the suicidal terrorists "on the ground" who I am more worried about. Any money for building a missile defence system would be better spent on the security services or satellite tracking of radioactive materials IMO. Agreed that having an independent nuclear deterrent is vital. Conversely, we can surely piggy back off a US missile defence system - seems no point reinventing the wheel on that. I'm not massively opposed to developing the technology but who exactly is this sheild going to be protecting us against? Iran, North Korea or China? Do we really want the US putting up a protective umbrella over itself? The international diplomacy equivalent of a gated community may seem nice but would building such a barrier and putting the Chinese on the other side of it be beneficial? Personally I think the money would be better spent on rebuilding Iraq. The problem with MAD is that it may not work with MAD mullahs, or ayatollahs in the case of Iran, in the same way that it worked with the atheists who controlled the Soviet Union. I agree with malcolm. Since we are not willing to bomb Iran back into the stone age, we need to have some kind of defense system ready when the mullahs are capable of doing damage to us. "Do we really want the US putting up a protective umbrella over itself?" Whether you want it or not is pretty immaterial. The choice is for them. Hoowever, if they make the choice, I would certainly want us to join in. "Gated community" type language is symbolic left wing agitation. If you live in a dangerous neighbourhood, you take sensible precautions. Typo: symbolic of left wing agitation. Maybe, but if Iran really wanted it could invade Iraq or Afganistan right now, or launch missiles and bombing raids every day against Israel. It doesn't because the leaders know they'd lose. So they work indirectly by funding and supplying insurgents and Hamas. My belief is that if they had nukes they wouldn't launch missiles themselves because then Iran (Islam's great hope) would cease to exist. Instead they would give some group of nutters a bomb and thus gain deniability, and can do it again and again. The ones at the top are a bit more subtle than the idiot suicide bombers at the bottom. ...we need to have some kind of defense system ready when the mullahs are capable of doing damage to us. 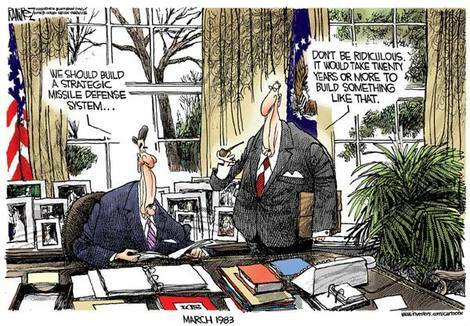 Yes, the defense system is self-preservation. If they do anything stupid, the mullahs need to be mutually assured of their destruction. Aristeides, no. The hawks are just as active in Korea as the UK. Why should they be any different to you in feeling fully justified to possess the means to defend themselves - including first-strike if necessary. If their nukes are made impotent by our defences then they’ll clearly keep on going until they get around whatever we create… and hence the arms race. The fact of the matter is that the “umbrella” isn’t impenetrable – it just takes ever more missiles to get through it. I am not sure I follow your logic, Mark. I sure would like to be two steps ahead of people like Kim Jong-Il, i.e. when he has nuclear missiles ready to fly over here, I sure want to be able to knock them out of the sky. Don't see any point in putting that in the too hard tray or just thinking the neighbours won't like it. The current MAD situation certainly hasn't stopped him racing to arms in the meanwhile. Aren't we mixing the two things up? Trident is our independent nuclear deterrent, missile defence is the reverse of that, a system designed to intercept incoming. That may be right for now, Jon. But suppose that in say twenty or thirty years time Islamic fanatics had secured other significant bases around the world. Then they might calculate that it would be worthwhile sacrificing one or more of them in a full nuclear exchange, if it would wipe out the most powerful of the infidel states. Muslims go to Paradise and infidels are doomed to go to Hell anyway, the deaths of billions would be of relatively little importance provided that the end result was a world dominated by Islam with everybody worshipping Allah forever more. Bruce Kent rather than Margaret Thatcher by repositioning the party on the unilateralist left. It will certainly be a cracking way of outflanking Labour. Shall we open a book on it? I sure want to be able to knock them out of the sky. If KJ II builds enough nukes you won't be able to. That's why NMD fuels an arms race. Exactly the same motivation that has driven him to catch up now will drive him to catch up once we temporarily render his missiles unreliable. Meanwhile said arms race consumes so many resources that we’re unable to tackle the real threats. John Irvine is of course correct. In fact the Tories started the defence rot by taking a premature dividend from the fall of the Berlin Wall which had more to do with the financial screw up they had created than the end of communism. The Tories would give the services cans and string for communication if it met their ideological objectives. Remember the Falklands? Rifkind (in particular) started the rot esbonio. Can we hope for extra defence spending from Liam Fox or will Cameron have spent it all on the N H S? NK will not be allowed to have enough weapons to defeat a missile defence program. The cold war was against foes equal to us, that were as unwilling as us to use these weapons. MAD was the way to go. The development of new states with Nuclear capabilities is a totally different matter. If they were to launch a nuclear weapon attack against the US and UK, there is little in the way of response other than obliterating that country with trident. However with a Missile Defence Program their weapon can be shot down and a lesser response can be contimplated. Is it God or the benevolent alien who is going to stop them? We had no power to stop them developing and testing nuclear weapons and we now have even less power to stop them building them. If they were to launch a nuclear weapon attack against the US and UK, there is little in the way of response other than obliterating that country with trident. Which is the best way of ensuring that they never launch an attack. However with a Missile Defence Program their weapon can be shot down and a lesser response can be contimplated. That would be a powerful argument if you believed that the contemplation would last more than about 10 seconds.